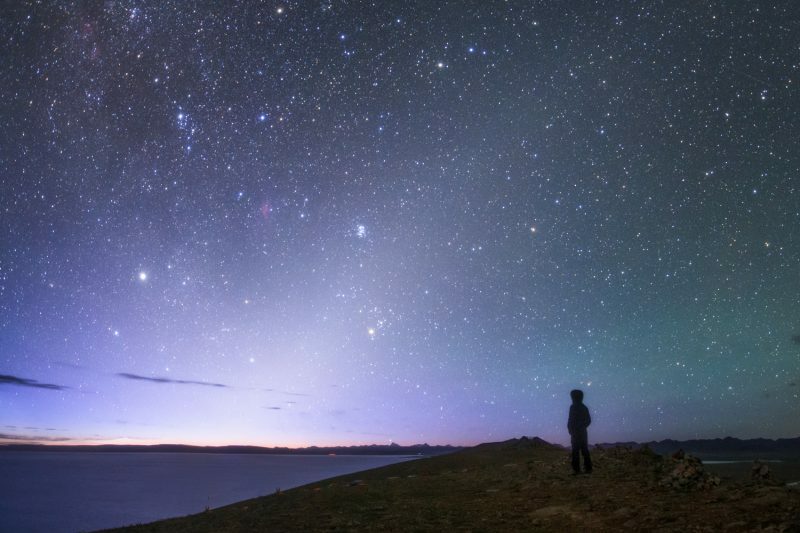 The zodiacal light is an eerie light extending up from the horizon before true dawn begins. Southern Hemisphere? Look after sunset! View larger. | Lubomir Lenko Photography wrote from Brehov, Slovakia, on August 18, 2018: “The rise of Orion is back with the fine shine of zodiacal light.” Orion is in the lower right. See its Belt, the 3 stars in a short, straight row? The zodiacal light nearly fills the frame in this photo. Can you see that the light is pyramid-shaped? From the Northern Hemisphere, with the October moon just past new, try looking for the zodiacal light – or false dawn – an eerie light in the east before sunrise, visible in clear dark skies in the months around the autumn equinox. If you’re in the Southern Hemisphere, look in the west after sunset instead, for the same phenomenon, now called the false dusk. The light looks like a hazy pyramid. It appears in the sky just before true dawn lights the sky. It’s comparable in brightness to the Milky Way, but even milkier in appearance. 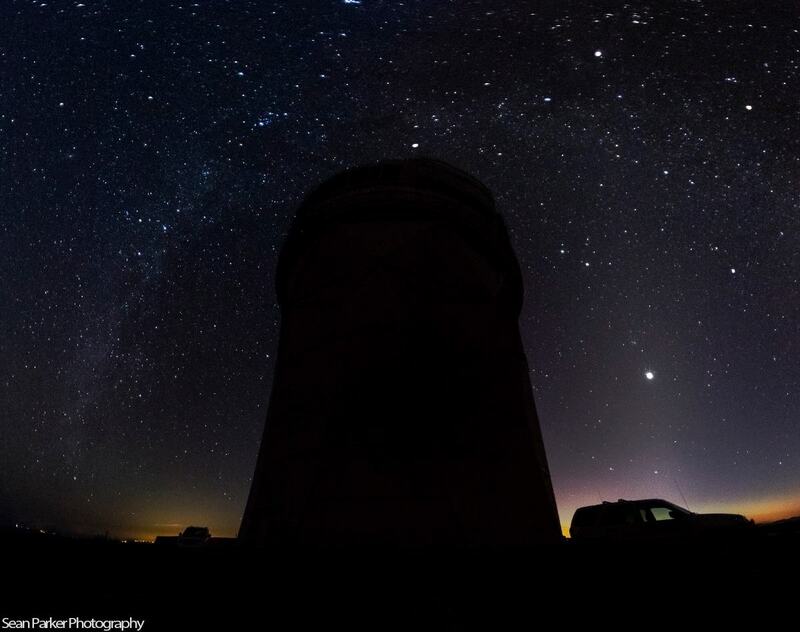 Maybe you’ve seen the zodiacal light in the sky already and not realized it. Maybe you glimpsed it while driving on a highway or country road. This strange light is a seasonal phenomenon. Springtime and autumn are best for seeing it, no matter where you live on Earth. Zodiacal light before dawn via Jeff Dai. 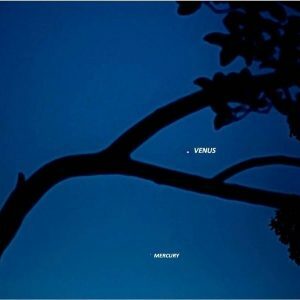 How can I see the zodiacal light? Suppose you’re driving toward the east – in the hour before dawn – in autumn. You catch sight of what you think is the light of a nearby town, just over the horizon. But it might not be a town. It might be the zodiacal light. The light extends up from the eastern horizon, shortly before morning twilight begins. 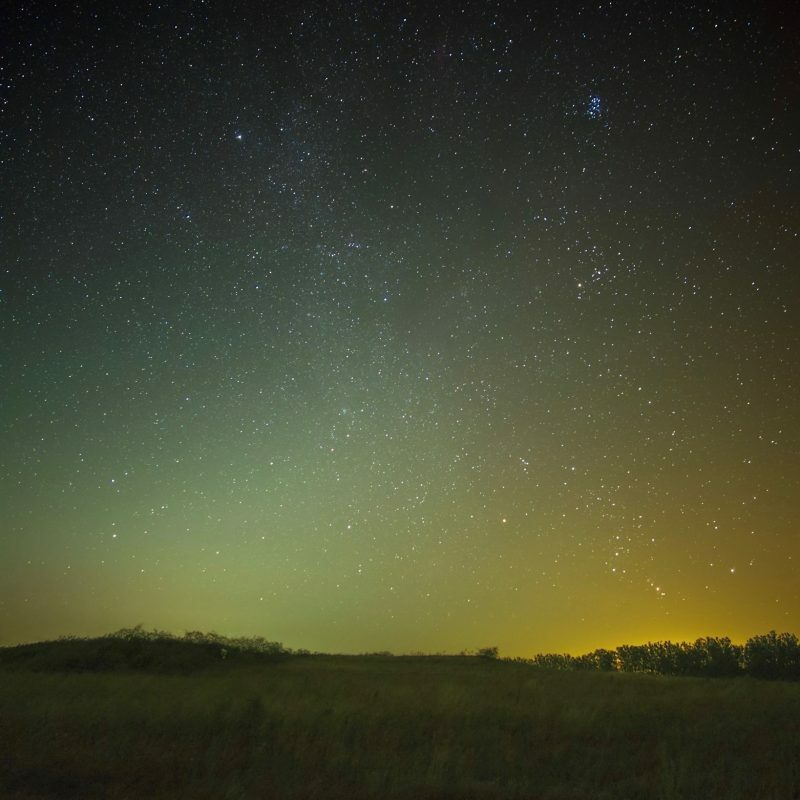 The zodiacal light can be extremely bright and easy to see from latitudes like those in the southern U.S.
We also sometimes hear from skywatchers in the northern U.S. or Canada who’ve captured images of the zodiacal light. You’ll need a dark sky location to see the zodiacal light, someplace where city lights aren’t obscuring the natural lights in the sky. The zodiacal light is most visible before dawn in autumn because autumn is when the ecliptic – or path of the sun and moon – stands nearly straight up with respect to your eastern horizon before dawn. 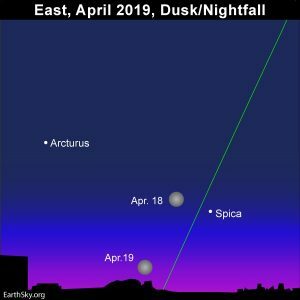 Likewise, the zodiacal light is easiest to see just after true night falls in your springtime months, because then the ecliptic is most perpendicular to your western horizon in the evening. That’s true no matter where you are on Earth. 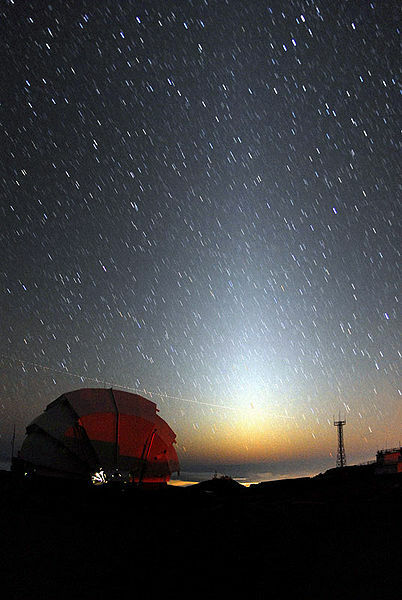 In autumn, the zodiacal light can be seen in the hour before true dawn begins. Or, in spring, it can be seen for up to an hour after all traces of evening twilight leave the sky. 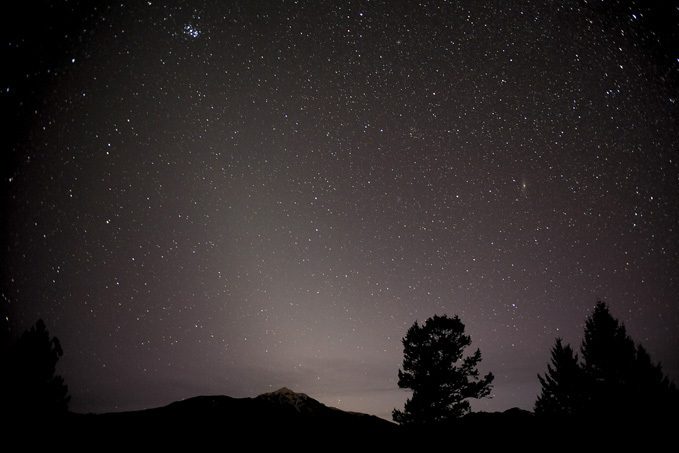 Unlike true dawn or dusk, though, there’s no rosy color to the zodiacal light. The reddish skies at dawn and dusk are caused by Earth’s atmosphere, while the zodiacal light originates far outside our atmosphere, as explained below. The darker your sky, the better your chances of seeing it. Your best bet is to pick a night when the moon is out of the sky, although it’s definitely possible, and very lovely, to see a slim crescent moon in the midst of this strange milky pyramid of light. If you see it, let us know! If you catch a photo, submit it here. Zodiacal Light over the Faulkes Telescope, Haleakala, Maui. Photo via Rob Ratkowski. Springtime? Autumn? When should I look? 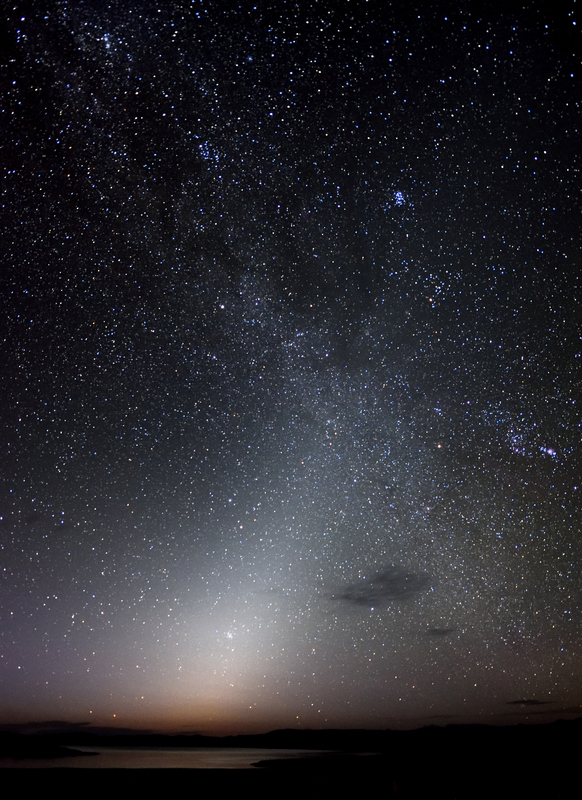 Is there a Northern/ Southern Hemisphere difference between the best time of year to view the zodiacal light? Yes and no. 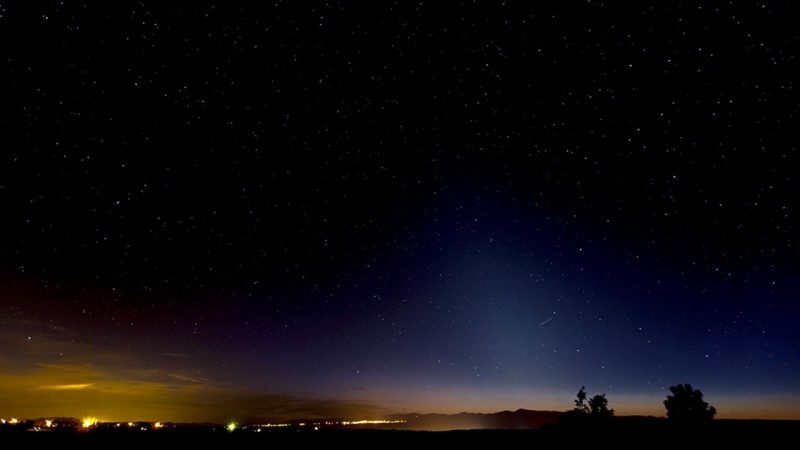 For both hemispheres, springtime is the best time to see the zodiacal light in the evening. Autumn is the best time to see it before dawn. No matter where you live on Earth, look for the zodiacal light in the east before dawn around the time of your autumn equinox. Look for it in the west after sunset around the time of your spring equinox. Of course, spring and autumn fall in different months for Earth’s Northern and Southern Hemispheres. So if you’re in the Northern Hemisphere look for the zodiacal light before dawn from about late August through early November. In those same months, if you’re in the Southern Hemisphere, look for the light in the evening. Milky Way on left in this photo. Zodiacal light on right. This photo is from EarthSky Facebook friend Sean Parker Photography. He captured it at Kitt Peak National Observatory in Arizona. The pathway of the sun and moon was called the zodiac or Pathway of Animals by our ancestors in honor of the constellations seen beyond it. The word zodiacal stems from the word zodiac. In other words, the zodiacal light is a solar system phenomenon. The grains of dust that create it are like tiny worlds – ranging from meter-sized to micron-sized – densest around the immediate vicinity of the sun and extending outward beyond the orbit of Mars. Sunlight shines on these grains of dust to create the light we see. Since they lie in the flat sheet of space around the sun, we could, in theory, see them as a band of dust across our entire sky, marking the same path that the sun follows during the day. And indeed there are sky phenomena associated with this band of dust, such as the gegenschein. But seeing such elusive sky phenomena as the gegenschein is difficult. 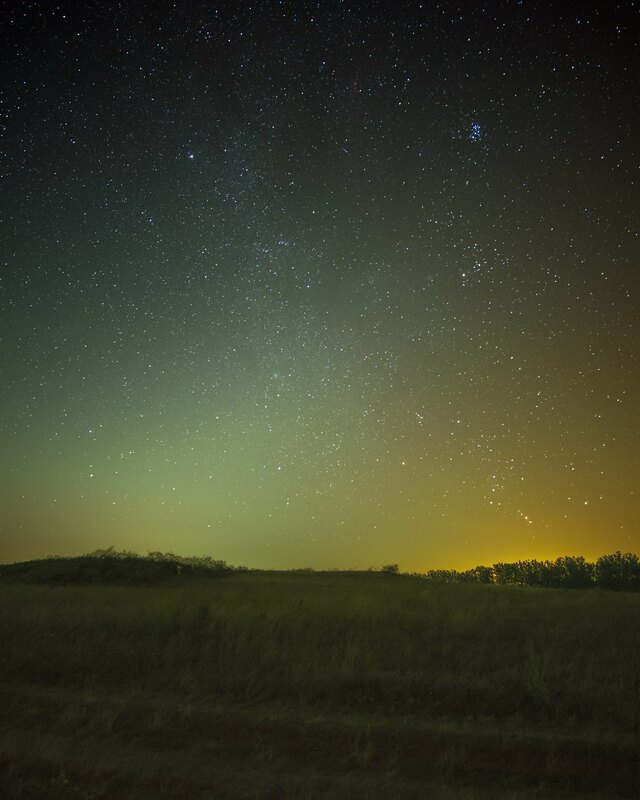 Most of us see only the more obvious part of this dust band – the zodiacal light – in either spring or fall. The zodiacal light is the diffuse cone-shaped light extending up from the horizon on the right side of this photo. Photo by Richard Hasbrouck in Truchas, New Mexico. The zodiacal light is easier to see as you get closer to Earth’s equator. But it can be glimpsed from northerly latitudes, too. 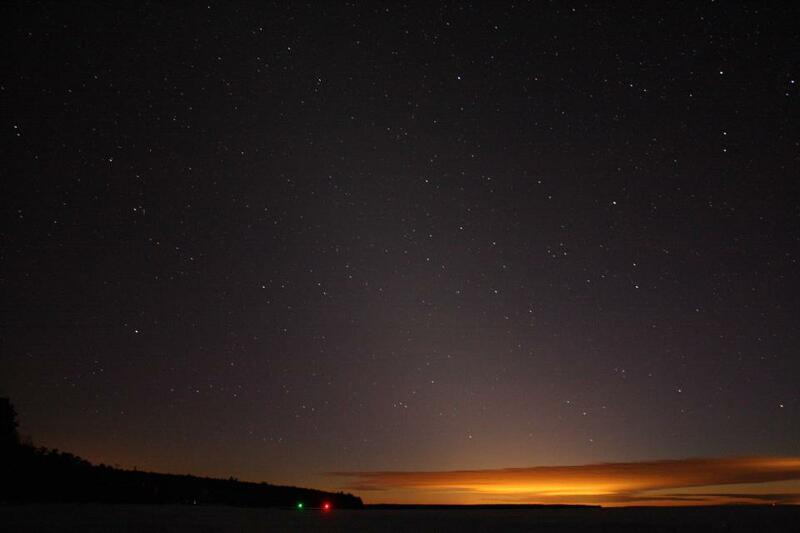 Here’s the zodiacal light seen by EarthSky Facebook friend Jim Peacock on the evening of February 5, 2013, over Lake Superior in northern Wisconsin. Thank you, Jim! Bottom line: The zodiacal light – aka false dawn or dusk – is a hazy pyramid of light, really sunlight reflecting off dust grains in the plane of our solar system. No matter where you are on Earth, the coming week – just after new moon – is a good time to look for it.